In 2003, Proinnsías Ó Duinn was appointed Conductor Laureate of the RTE Concert Orchestra, after holding the position of Principal Conductor since 1978. Shortly after being invited to take the position with the RTE Concert Orchestra, he became Music Director and Conductor of Our Lady’s Choral Society. 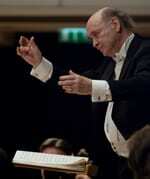 Originally a cellist, Proinnsías was appointed Conductor of the Iceland Symphony Orchestra in 1963. After this, he held the position of Music Director and Principal Conductor of the National Symphony Orchestra of Ecuador. He has conducted both the RTE Concert Orchestra and the RTE National Symphony Orchestra in a wide-ranging repertoire on CD for Marco Polo and Naxos and Lyric labels. As a composer, he has written music for most genres, from chamber music to symphonic, T.V. and stage. The seven-hour T.V. epic production, “Strumpet City”, for which he composed the soundtrack, has been transmitted worldwide, and more recently, issued on DVD. His musical “Stuff & Nonsense” was premiered in the NCH, and is based on the life and writings of Edward Lear. He is also in demand as an arranger and orchestrator. Proinnsías has always been aware of the special relationship that exists between man and his dog. Recent research, indicating not only unconditional loyalty, but also the sensitivity and therapeutic value of the dog for humans, comes as no surprise to him. He greatly appreciates and admires the work Irish Therapy Dogs is doing throughout the country and is delighted to be associated with the organisation. Sandra B. Barker, Ph.D., NCC, LPC Dr. Sandra (Sandy) Barker is Professor of Psychiatry and Bill Balaban Chair in Human-Animal Interaction at Virginia Commonwealth University (VCU) where she serves as Associate Director for Inpatient Psychiatry Programs and Director of the School of Medicine Center for Human-Animal Interaction. She is internationally known for her research on the health benefits of interacting with companion animals, a research program that has been ongoing for over 20 years. Sandy has an extensive background in animal-assisted therapy, including visiting healthcare facilities with her own therapy dogs and helping with the creation of the Dogs on Call (therapy dog) program at VCU Medical Center. She supervises medical and other students completing educational activities with The Center for Human-Animal Interaction. Sandy also holds a joint appointment as Adjunct Professor of Small Animal Clinical Sciences at Virginia- Maryland Regional College of Veterinary Medicine in Blacksburg, Virginia, where she provides consultation on pet loss issues. Sandy’s research has been published in numerous professional journals and she has made presentations to professional and public audiences internationally. She lives in rural Hanover County, Virginia, with her husband Randolph, amidst a host of wildlife. Since recently losing their last two Lhasa Apsos, they have been actively volunteering with a local pet rescue organization. 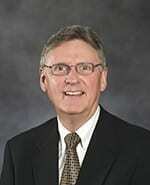 Dr. Randolph T. Barker (Randy) is a Professor of Management at Virginia Commonwealth University’s (VCU) School of Business. He is a Professor of Healthcare Administration for the Medical College of Virginia’s Healthcare Fellows Program and teaches in the Executive MBA and the Executive Information Systems Programs in the VCU School of Business, and the VCU Healthcare Administration Fellowship Program of which he is a Faculty Fellow. Dr. Barker has also worked in the private sector as an Employee Relations Associate and in the public sector as an Executive Assistant. Randy has had pets and more over dogs (Lhasa Apsos) throughout his life. He is known internationally for his work with animals in the workplace, organizational communication, team leadership and his interdisciplinary research has been extensively published in numerous professional journals. His early human-animal bond research coupled with his love of dogs began a life of involvement in the connections we have with our animals. He is a founding member of the Executive Committee for the Medical College of Virginia, Center for Human Animal Interaction and is the first elected Public Regent to American College of Veterinary Ophthalmologists Board of Regents. Much of this work public service focused on strategic thinking, leadership, policy, and public awareness of the benefits of animals in our lives. Randy lives in rural Hanover County, Virginia, USA with his wife Sandra, amidst a host of wildlife and tending a school of Coi and Goldfish. Since recently losing their last two Lhasa Apsos, they have been actively volunteering with a local pet rescue organization. 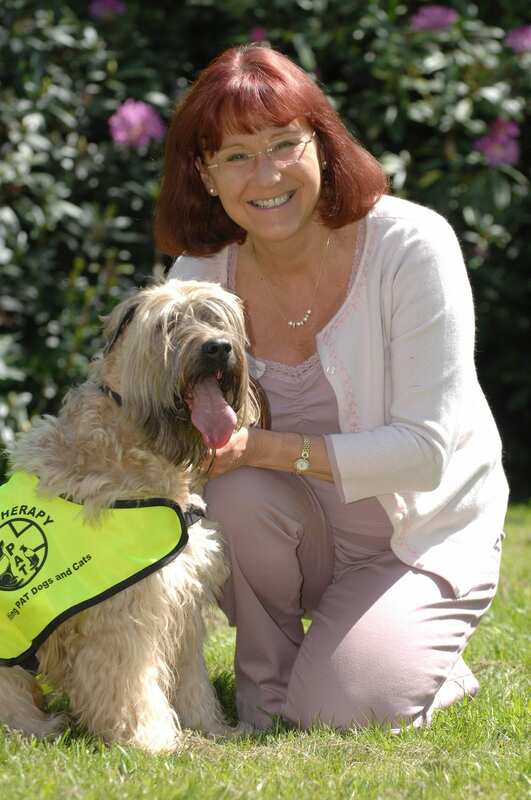 Maureen Hennis retired Chief Executive of the UK charity Pets as Therapy, who spearheaded the charity for a number of years, leaves an organization with over 4,300 dogs and 108 cats who undertake therapy visits to over 126,000 people per week. 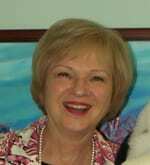 Maureen has always been passionate about dogs and during her childhood, dogs were always part of her family. To quote Maureen, “Companion dogs of several breeds shared our lives. We had a Scottish Terrier, Corgi, Cocker Spaniel, Boxer, Labrador and a Toy Poodle.” She was a keen breeder of Afghan Hounds and a member of the Kennel Club for many years. As the public face of Pets as Therapy, she actively participated in the media, not only representing and promoting Pets as Therapy, but also talking about general canine matters from health issues to judging dogs. She was a leader in organizing a national petition to amend the Dangerous Dogs Act in the United Kingdom. She now is enjoying her retirement in the Highlands of Scotland.